Today is Foliage Follow-Up at Pam Penick's Austin blog Digging. But as I ventured out to take some photos for today's post, I discovered flowers that hadn't been open yesterday for my Bloom Day post. Forgive me for hijacking the foliage post but I first had to include this image of tiny Tulipa hageri x aucheriana 'Little Princess' as a Bloom Day postscript. What an amazing difference one day of just partial sun can make! Now on to our intended subject: foliage. First, moss. I love the way moss looks good in Portland's wettest weather. This is Sagina subulata, also known as Irish Moss. Right on time for St. Patrick's Day, it's looking fabulous. A naturally occurring moss in the garden: it came here all by itself. The new growth on the salal, Gaultheria shallon, brightens up the understory of the cedars. Eryngium planum 'Jade Frost' is sprouting a small rosette of pink-edged leaves. The new foliage of Astilbe arendsii 'Glow' reminds me of a small peony unfurling. Our mild winter was kind to Tetrapanax papyrifera 'Steroidal Giant' - that lower leaf lasted all winter and more are coming quickly now. I'm thrilled by its promise of greater height this summer. My chartreuse Japanese maple is just beginning to open. I liberated this as a 2-inch seedling - one of hundreds under a landscape tree at Providence hospital. After four years, it's over four feet high. And speaking of chartreuse, there's no better color to epitomize spring. 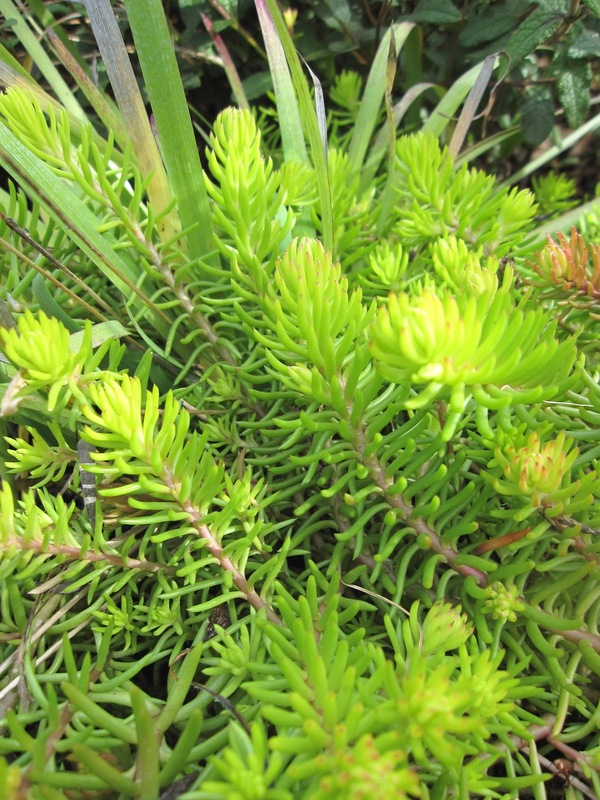 Here is Sedum 'Angelina' with a few Sisyrinchium californicum poking through. Thank you, Pam, for hosting Foliage Follow-Up today! I'm short of time and dry weather this month. But I found some blooms to share and even a surprise out in the wet, wet garden. First up, a bit of a cheat: I bought Grevillea junipera 'Lava Cascade' at the Yard Garden and Patio show last month. But it's in bloom, so it gets a photo and a mention today. Yes, I'm actually going to risk my heart again with this beloved Grevillea which I grew and lost last year as 'Low Red'. Mahonia aquifolium is budding hard and just opening. It looks great backed by the neighbor's garage wall we painted "Chocolate". I showed Vaccinium ovatum last Bloom Day, and it's still going strong. We have three camellias that are covered with fat, pregnant buds, but only one actual bloom so far. It's a perfect flower if you can ignore the white over-spray specks from last summer's paint job. Daphne odora is perfuming the entire back garden. 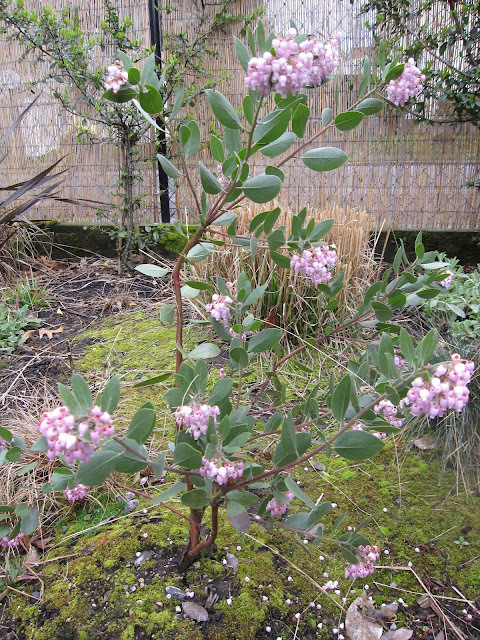 Arctostaphylos x 'Austin Griffiths' is putting on a soft pink show. 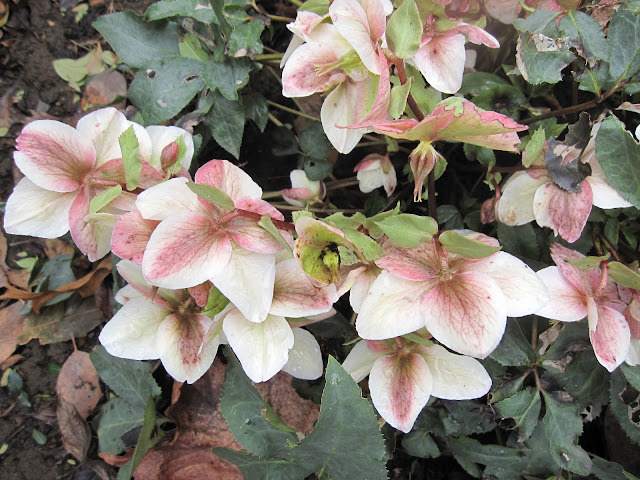 Helleborus argutifolius, despite three moves (one late last fall), has decided to bloom like crazy. I tried to find more of this amazing performer, but no one seems to have any of the argutifolius. And last, here's the surprise: Loropetalum chinese 'Sizzling Pink' has one tiny bloom. There aren't any other buds on the plant, so I guess it's an anomaly....I'll take it! Thanks go out to Carol at May Dreams Gardens for hosting Bloom Day every month. Pop over there to see blooms galore!